Nintendo is launching the first major revision of its 3DS hardware on February 13 in the U.S. The *New* Nintendo 3DS XL doesn’t exactly have a name that rolls off the tongue, but it does reflect that what you’re getting is hardware that’s very similar to its predecessor, albeit with some fresh paint and new features that really do help make a big difference in very specific areas. The result is a handheld console that feels as though it has ‘graduated,’ in terms of both user experience, as well as fit and finish. The New 3DS XL bears more than a passing resemblance to the old 3DS XL, but some things have changed to make way for new buttons and controls, and even familiar parts have been relocated as a result. That’s not necessarily a bad thing, however: In some cases it makes for a better user experience, and in others it makes things a tad more inconvenient, but overall it should require very little learning time or adjustment both for users of previous 3DS hardware and those entirely new to the platform. Nintendo has finally added that second analog control stick that many clamored for, even dating back to the introduction of the original 3DS itself. It’s so small you’d be forgiven for missing it after a cursory glance, and while touching it outside of any game that supports it might suggest it offers little in the way of travel, while playing both Monster Hunter 4 Ultimate and the new Majora’s Mask 3D remake, it proved immensely useful while controlling the camera, and surprisingly responsive and accurate. The new rear trigger buttons expand the potential for game developers on the platform, and are reasonably easy to find without resulting in any accidental presses of the existing L and R buttons despite their placement. Nintendo has also repositioned the start and select buttons, to a much more convenient location under the XYAB buttons, and put the volume slider on the opposite side of the top half of the clamshell, across from the 3D slider, which makes a lot more sense. It’s also better-designed than the old volume slider. Things about the design changes that aren’t great include the decision to put the stylus slot at the front of the device, where it’s less easily reached than at the side while gaming. There’s also no dedicated hardware switch for wireless, which makes it slightly harder to save battery on the fly. Overall, the design changes add up to net benefit for any gamer, though, and the new design also just feels better put together. My own previous ‘old’ 3DS XL units felt more cheaply made, and the special edition NES controller version I picked up recently had the bottom case creak issue that tends to afflict the older design. 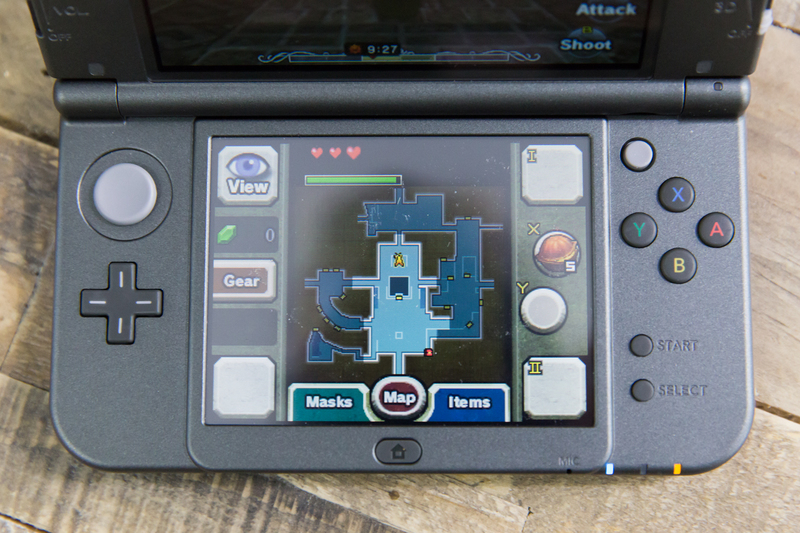 The New 3DS XL feels like it has much more precise and solid construction, by comparison. One thing about the new design that is far from ideal is how the SD card slot has changed to a microSD port located underneath the closed back battery panel, which is fixed in place with two small screws. This requires using a specialized, computer-style screwdriver to gain access to the compartment, and in no way encourages easy switching. Nintendo also doesn’t provide very much storage out of the box: The card only offers 4GB, even though the slot supports up to 32GB. Honestly, though, I’m not generally playing more than one or two games at a time, and with the Nintendo eShop offering unlimited redownloads of owned titles, this hasn’t presented much of a problem. In addition to the new hardware controls mentioned above, the big new features of the New 3DS XL are improvements to the glasses-free technology that was the marquee launch feature of the handset when Nintendo first made it official, as well as built-in NFC support to enable compatibility with Nintendo’s new Amiibo figurines. For now, with only a few games announced that will support Amiibo on the platform, it’s not a huge selling point, but it’s a technology that Nintendo will likely continue to support well into the future, in both its own games and via encouragement for third-party devs, too. Already, demand has been high for the figures, despite software support being limited to just a few titles on Wii U. 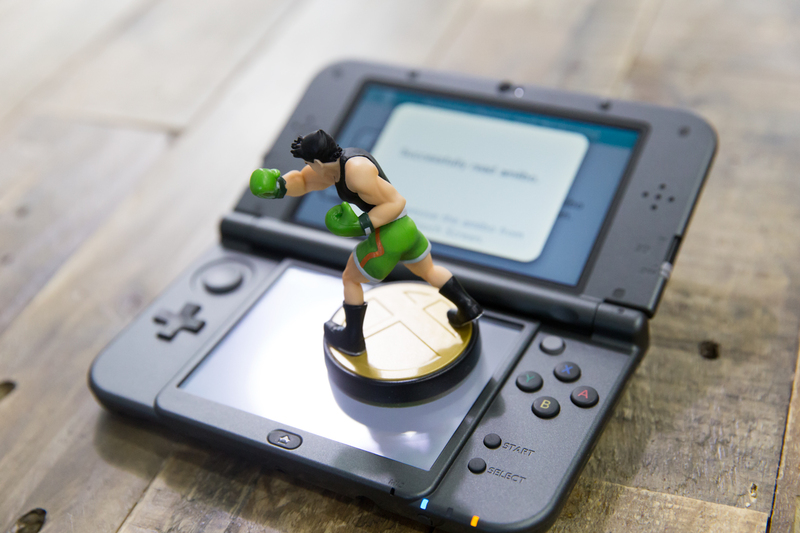 With the New 3DS, you can already register your Amiibo figurines via a system menu, but the real pay-off will start to come when updates (including one inbound for Super Smash Bros. 3DS) start to roll out. The improved 3D is exactly what it needs to be – improved. If Nintendo can be said to have made a mistake with the original 3DS launch, it was foregrounding a glassesless 3D experience that felt mostly as though it probably still belonged in the R&D lab. The 3D on the New 3DS XL feels neither half-baked nor gimmicky – it still takes a second to set up the effect when you move your head beyond the range of the IR emitter and camera tracking your noggin, but it maintains the effect far better when you’re moving your head in the way you might naturally while, say, playing a game, which is something the original version was not very good at. Put it this way: The first thing I did when I got my NES controller edition 3DS XL late last year was turn the 3D slider all the way down, and I’ve never even considered turning it back up. With the New 3DS XL, I’ve been playing with it at max depth, and haven’t had cause to go back. Besides the 3D performance, which is greatly improved as you can see from the description above, the New 3DS XL boasts improved processing power, which results in smoother gameplay, faster menu operations and generally improved performance for everything from power on to sleep resume. It’s a better piece of gaming hardware when it comes down to the basics of gaming, and that’s no small tweak in a dedicated console. Other improvements to performance include slightly better battery life (which was borne out by my testing, but expect a few more minutes to an hour, not a hue extension) as well as better navigation in apps like the web browser thanks to the new C stick and ZL/ZR buttons. The camera is also better at snapping pics in dark environments, though it’s still nothing to write home about by any means. 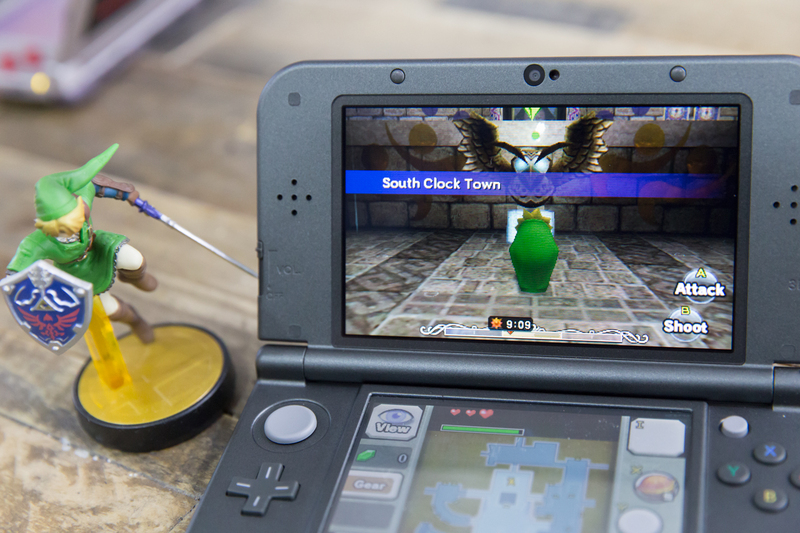 Performance tweaks alone probably aren’t reason enough to upgrade from older 3DS hardware, but it definitely contributes to the general feeling that this is a much-improved take on the original. The New Nintendo 3DS XL is better than its predecessor in just about every way. Taken alone, any individual improvement would seem minor when compared to the original 3DS XL hardware, but together they represent a worthwhile upgrade that improves the overall user experience significantly. This feels like what the 3DS should’ve been all along, and that’s coming from someone who enjoyed the old hardware enough to own two different editions. My main complaint for the new hardware, in fact, is that Nintendo has opted not to include a 3DS charger in the box. It has explained this decision as stemming from the fact that many of those purchasing this device will already have their own charger, but when it’s a proprietary device and you can’t guarantee you’re pulling entirely from existing owners of DS and later devices (which would be at cross-purposes with Nintendo’s business goals for the product anyway) it’s a lot to excuse. I’ll let Nintendo off the hook in this case only because you can get a perfectly good off-brand 3DS charger from Amazon for $5 (or $12 for the official solution) but it’s still an annoying ask. Despite that questionable decision, the New 3DS XL is a great success for Nintendo overall, and a dedicated mobile game console that reminds you why that category of devices still exists to begin with. Plus, as more games support its new hardware features, it’s only going to get better.